If you have ever been to a podiatrist, you were most likely told that sandals are bad for your feet, but in our office, we all LOOOOVE sandals! So, don’t be fooled thinking we are sporting our supportive gym shoes and orthotics at the pool or with a cute sundress! 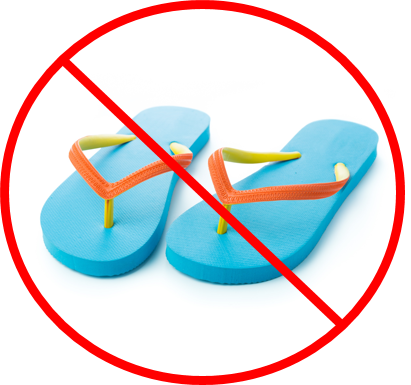 We are, however, very picky when it comes to what sandals we do wear - $2 flip-flops don’t make the cut in case you were wondering. She L-O-V-E-S her Spencos for their support, cushion, and great color options! I have a flatter arch and the Birkenstock insole feels like a cloud on my feet. I think they look really cute, too! As much as we like showing off our pedicures, we still follow our own advice when it comes to appropriate shoe gear - gym shoes are still the best when it comes to most outdoor summer activities like running, biking, hiking, or walking around theme parks. We’re always here to help you put your best foot forward, so give us a call if you have any other questions (630)834-3668.